There is a high probability of a significant wildfire outbreak in West Texas and the Panhandle on Tuesday, Texas A&M Forest Service said. High winds paired with above normal seasonal temperatures, low relative humidity and a dry line could cause elevated to critical wildfire conditions Tuesday. Wing gusts are expected to reach between 30 and 35 mph in the DFW area. The Storm Prediction Center says gusty winds and low humidity in drought-stricken areas will create dangerous fire conditions in parts of Colorado, Kansas, New Mexico, Oklahoma and Texas. National Weather Service meteorologist Doug Speheger says such conditions haven't been seen in at least a decade. Areas of concern for wildfires include Amarillo, Fort Stockton and Midland/Odessa. Warnings are also in place for Oklahoma as firefighters in rural parts of the state battle blazes that have killed at least two people. The largest of the Oklahoma fires has burned more than 384 square miles. With elevated fire danger, caution should be used with any outdoor activity that may cause a spark. It only takes one spark to start a wildfire. Postpone outdoor burning until conditions improve. Avoid parking and idling in tall, dry grass. Catalytic converters can get hot enough to ignite the grass under a vehicle. Avoid setting hot chainsaws or other hot, gas-powered equipment in dry grass. Wildfires burning in grass can spread and grow extremely fast. It is important that if you spot a wildfire you report it immediately to local authorities. A quick response can help save lives and property. "With these conditions wildfires can spread rapidly, present control issues for firefighters and pose a real threat to public safety," said Texas A&M Forest Service Fire Chief Mark Stanford. 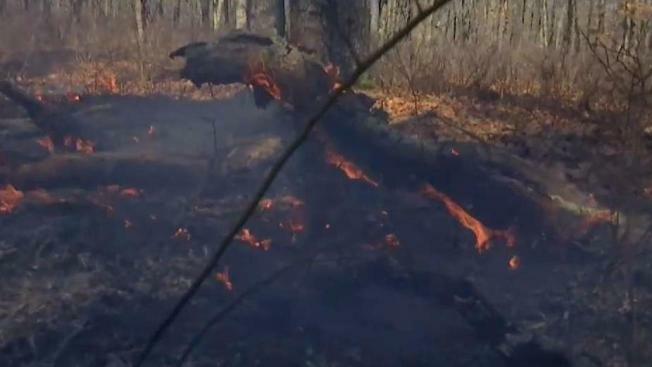 "The Southern Plains Wildfire Outbreaks can be extremely dangerous if a wildfire occurs, it is important that you heed any wildfire warnings from local officials."